SPromX, captured by Cara Bean. 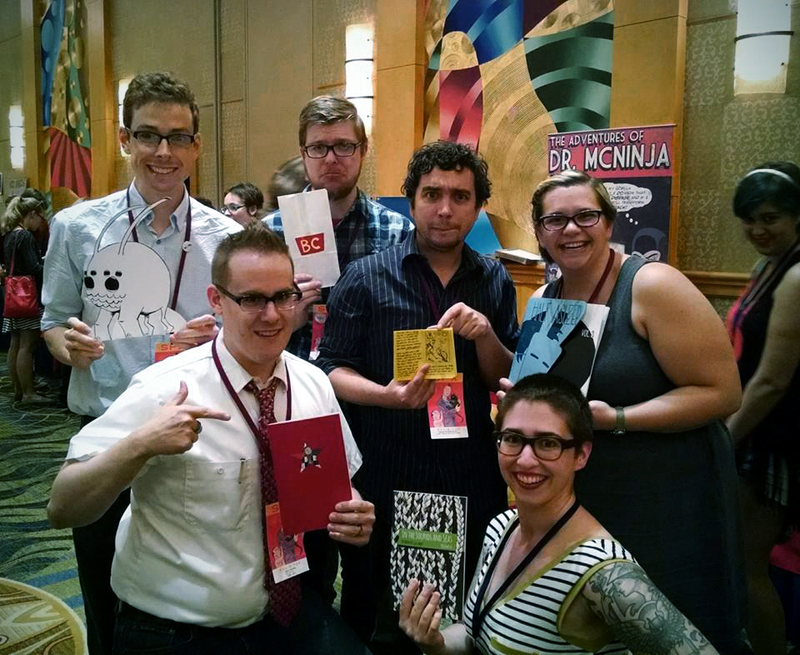 Impressions of the 20th Small Press Expo from the Festival Season authors / cartoonists / book buddies. It’s so full of the stuff we care about, and the people we care about, and discussions about the stuff we care about with the people we care about, that it always takes a lot longer to process than it does to actually happen. And on top of that, this year there was dancing, so much dancing, and it is possible we are not as young as we once were, and then we were very tired. Below are scattered thoughts from your trusty Festival Season staff writers, arranged by topic. Four of us (Cara, Jason, Kenan, and Neil) were exhibiting, while our resident ex-pat Ann was watching (or trying not to watch) from afar. Feel free to leave your own impressions, or articulate your displeasure with ours, in the comments. 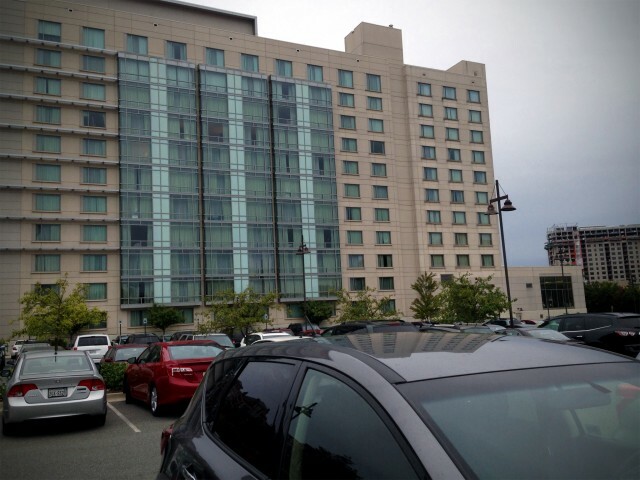 Kenan: SPX’s location hasn’t really changed in the time I’ve been attending, although it does seem to claim more and more of the Bethesda North Marriott every year. Remember the terrified looks we used to get as we passed the pantsuited attendees of some professional conference in the halls? Now it seems like us scrubs have the place to ourselves (although it should also be said that we’re a lot less scrubby than we once were, right? myself excluded). Every year you hear a handful of people suggest moving the event to DC or Baltimore or someplace else where we have friends with couches. It’s true that even piling up in our rooms as we do, SPX is a pricey weekend. And perhaps attendance could be better in a place with foot traffic. But the out-of-the-way-ness is so clearly central to the show’s magic. The interactions that happen in Bethesda are so different, and often so much less expected, than those at the shows where we all break off into our pre-existing clans when the floor closes. I personally wouldn’t want it any other way. 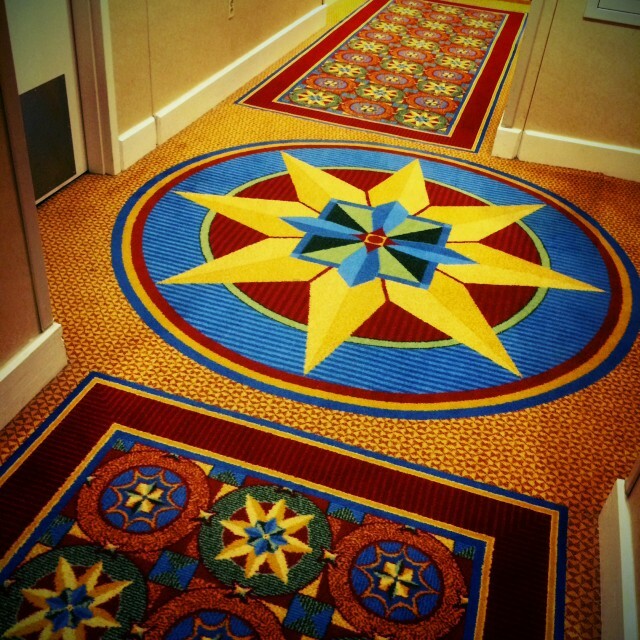 The Marriot’s mesmerizing carpeting. Cara stopped to snap a picture and no one knew where she was for two hours. Cara: The Marriot seemed to have more fancy toiletries this year. Cotton swabs and mouth wash. I filled my suitcase! Jason and I treated ourselves to the fancy buffet breakfast on Saturday and we pigged out so much that we weren’t hungry again until night time. The waitress hooked me up with take-out coffee and some muffins for later. Bless her. Ann: As the Festival Season writer so old that I frequently yell at the youths to ‘get off my lawn,’ I do remember the days when SPX was crammed into a more central location in downtown Bethesda. It was not great, compared to the Marriott – low-ceilinged poky rooms and, strangely enough, more difficult to find from the metro. 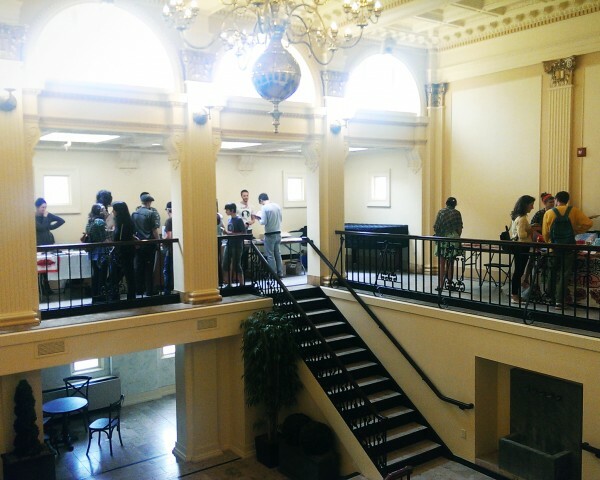 And the mix of conferences at the venue is part of the charm – where else are you going to find Miss Teen Maryland pageant contestants mingling with comic creators? Finally – can anyone who was there tell me how long it took before the ATM in the lobby ran out of cash? Jason: Balloon letters corresponding to each table block floated above us this year. It was a really smart touch that made navigating the floor much easier. All they need now are people-movers to carry us from section to section; the aisles are wide enough to walk through the crowd but that didn’t stop me from getting distracted and sidetracked by a thousand comic books en route to the balloon across the room. 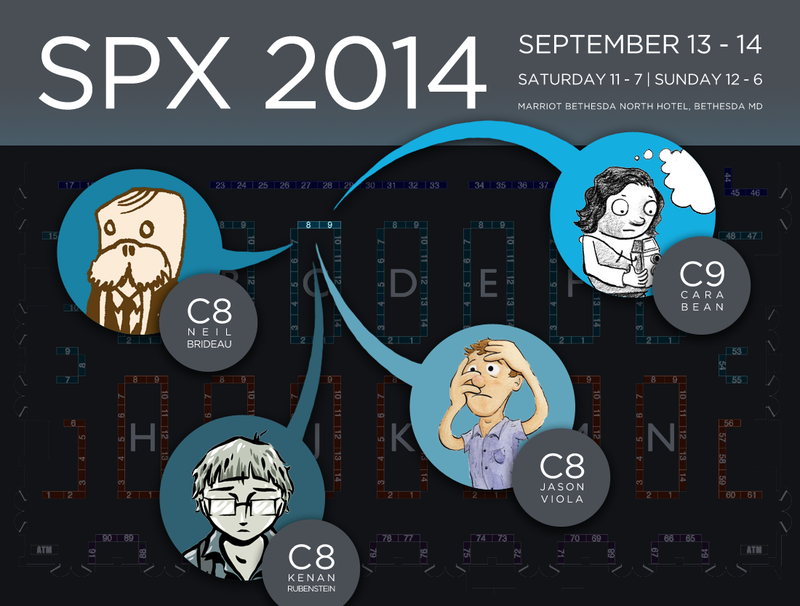 First draft of our SPX 2014 friends flyer, rejected by Neil for being too dour. There was so much I didn’t see. I tried to visit everyone but there was no time. Rob Clough quoted Warren Bernard with some crazy figure that you could only spend three minutes at each table if you want to see everything. I saw none of the panels I wanted to see. Multiple people told me Eleanor Davis’ panel was incredible. But I can’t write about it because I didn’t see it. Clough’s suggestion that there be a third day isn’t bad; you can’t justify it with sales but it would be nice to have more time. 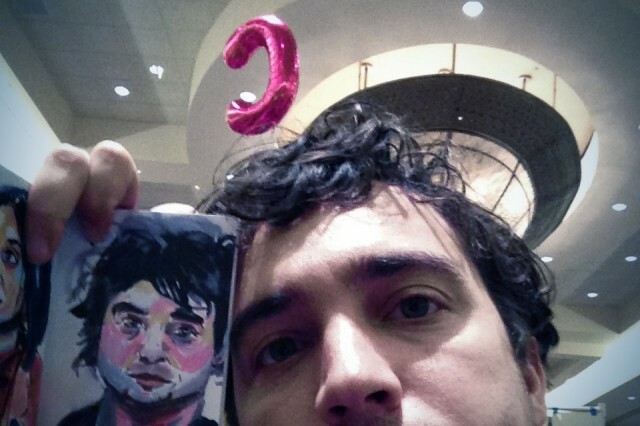 Second try: same dismal self-portraits hung amidst brighter, airier decor. 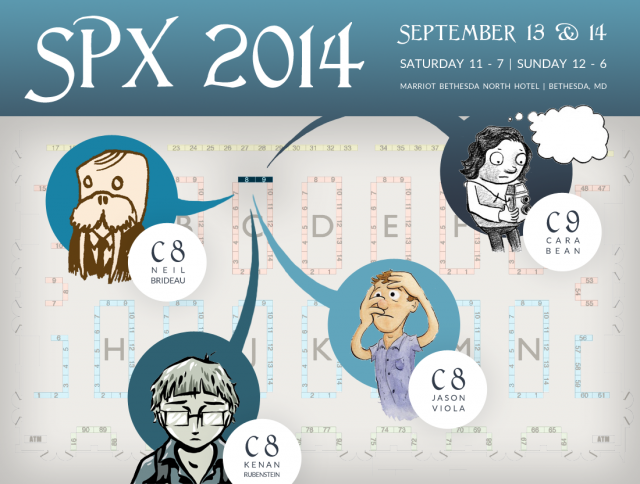 Cara: The organizers of SPX are lovely, hardworking people and have made me feel special online and at the venue. I really appreciate all of the consideration and planning that has gone into making SPX an excellent experience for cartoonists. I found myself wanting to high-five and gush at the staff whenever I had a chance. Kenan: SPX is such a well-oiled machine that you could easily never notice its gears turning. We know the show’s (volunteer!) staff is scrambling like mad to make the show as amazing as it is, and yet, to an exhibitor, it does not appear to be a scramble. Everything just seems to happen when you’re told it will, everything is already in place. 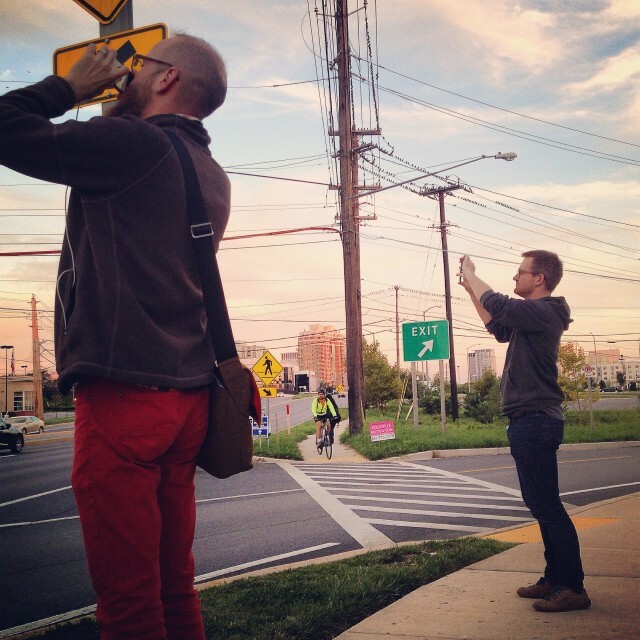 (Perhaps event organizing should also be 99% invisible?) It’s a really remarkable feat, and one that always reminds me why SPX is the gold standard of American alternative comics shows. There were a lot of people in attendance, but Cara, Jason, and Kenan managed to be a little bit suspicious of each and every one of them. Cara: People are almost always so nice who visit my table. All kinds of folks that impress and surprise me. 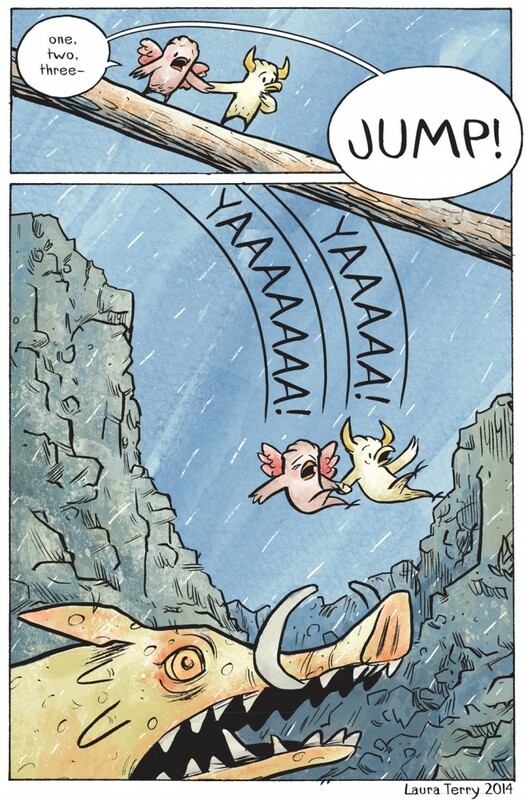 A lot of the people who buy my comics are people that I would want to have as friends if they lived near me. There were a few ladies in the line for Lynda Barry that instantly became my friends: Becky Hawkins, Glynnis Fawkes, Summer Pierre, and Meg Lemke. We formed a Sacred Lynda Barry Society of Lady Cartoonists. It might be a cult. Contact me if you would like to join us. Jason: We make comics to connect with people and in many ways SPX feels like a celebration of that connection. The crowd is full of comics fans, people who have fallen in love with a medium and are looking for new art that will light up their brains. 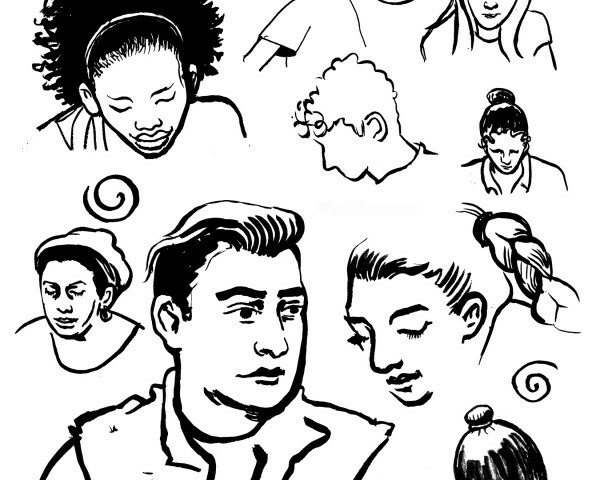 The crowd is full of cartoonists who have found an intimate way to express themselves and are hoping you will accept them for it. And the crowd is full of press, publishers, podcasters, podiatrists, and Presbyterians who are promoting and producing this continually growing comics culture. There was a wedding this year, but every year is kind of like a wedding. People from different backgrounds come together to celebrate a common connection. Sometimes that connection happens on the convention floor, sometimes (this year) on the dance floor, and sometimes it happens days later on the living room floor, when you read a comic that hits home and becomes a part of you. Ann: Jason’s explanation above demonstrates why I spent the entire weekend of SPX wandering about industrial east London, avoiding social media entirely. I didn’t want to run across posts talking about how great it was. I know how great it was! And hearing all of you reinforce that just makes it worse for those of us who couldn’t be there! When Cara took this, Neil was briefly escaping what was otherwise an extemely cozy weekend with Jay, me, Sam Sharpe, and Lale Westvind. The 5 of us squeezed our books into a table and a half. But the larger factor, I suspect, was my own enthusiasm. I’m always happy to be at SPX, but last year I was riding high with a new book that had recently garnered a bit of institutional recognition, and I was particularly excited to get it into people’s hands. It seems to me attendees pick up on that, one way or another. Jason’s SPX sales through the years. No one’s blaming anyone, even though this is clearly all your fault. 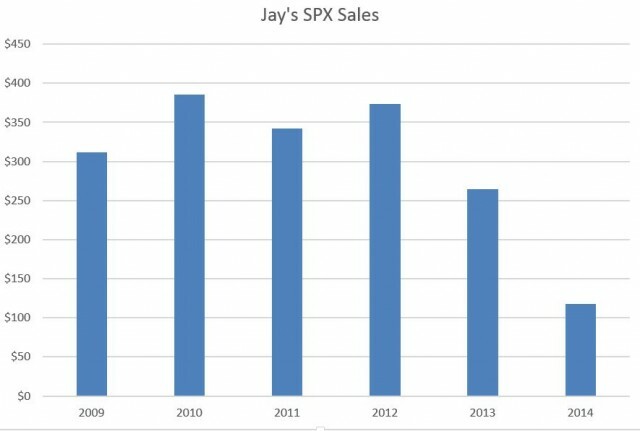 Jason: My sales at SPX have been dropping significantly in the past two years and I’ve been tabling with Cara for the last three. Is she also talking people out of handing me money? I can say for certain I haven’t received any matchboxes. 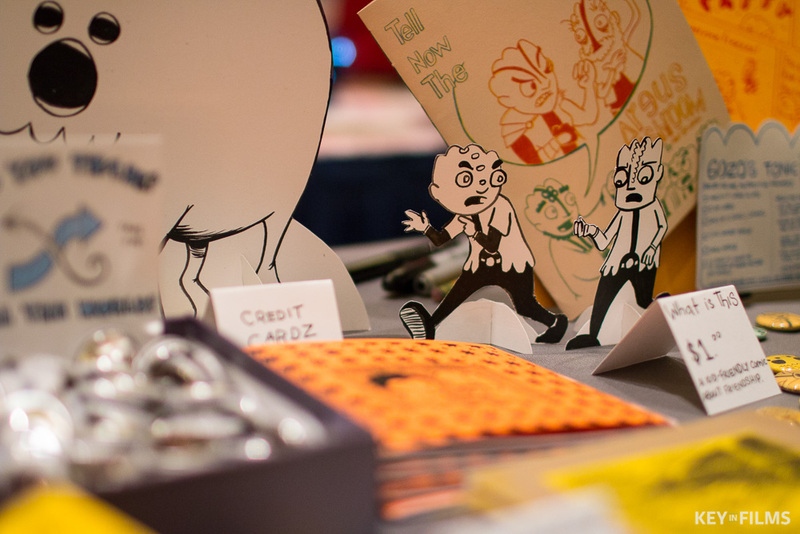 For a table with mostly $3 and $4 minicomics, my sales used to be pretty strong. But at this rate, I will soon be venturing into negative sales. Next year, I predict people will be showing up with old copies of Herman the Manatee & His Lousy Friends and demanding their money back. Honestly, I suspect the problem may be one of focus; I used to sell four comics at a full table, and this year I had eleven comics at a third-table. By adding more and more comics to my little space, I may be making it less welcoming to look through them. Ann: From a consumer perspective, SPX is the festival where I would plan to spend a large amount of money, and then end up leaving the festival having spent at least double the amount of what I had anticipated to spend. (Oh, Comic Book Legal Defense Fund auction!) But I echo Jason’s point – if I can’t give a sidelong glance to a table and quickly suss out what is on there, I’m more likely to pass it by. The #SPXorBust crew, with the work they did or didn’t finish in time for the festivities: Neil Brideau, Pranas T. Naujokaitis, Kenan Rubenstein, Beth Hetland, Mystery Admirer, Jeff Zwirek, & Marnie Galloway. 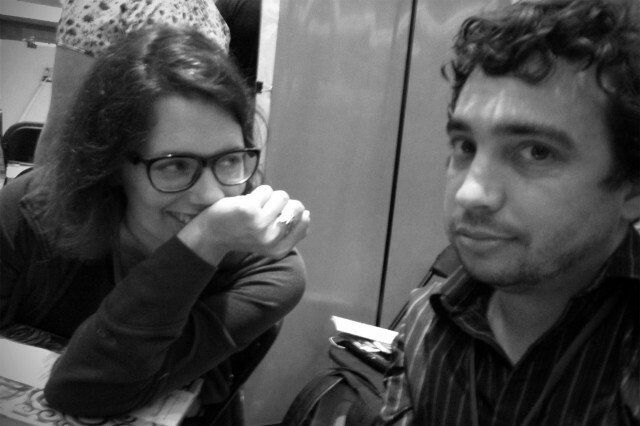 Jason and Rebecca had their comics finished with weeks to spare, and were deemed too responsible and productive to be associated with this organization. 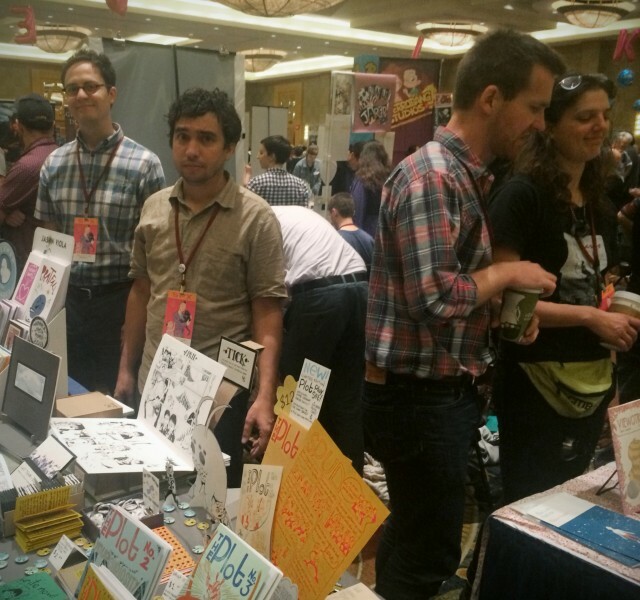 Kenan: SPX experimented with a new system of selecting its artists this year in their valiant ongoing effort to whittle the rising tide of alternative cartoonists into a manageable quantity of exhibitors. Roughly half the floor was curated by an opaque and inscrutable set of rules the organizers insist was not in fact curation, although the distinction, oft explained, remains utterly lost on me. The other half was selected by lottery. The grounds on which the former half was selected were articulated in a variety of ways: individuals who are part of SPX’s culture without whom the show wouldn’t be the same, or artists with a legacy, or people who had been involved with the show for more than five years. The four of us have each been exhibiting at (or, occasionally, volunteering for or attending) SPX for seven years, and two of us received invitations. We packed ourselves into half the space we once enjoyed and took turns being in each other’s way, which was irritating but basically fine. But many more of my close comics friends who entered the scene around the same time as I weren’t selected and didn’t manage to find space. For every stellar cartoonist-human I was thrilled to see in the lobby and share my post-fest french fries with, there was another whose sudden absence from our annual routines felt just devastating. To be clear: this is actually not a criticism of the new methodology (although I do wish it had been more transparent). 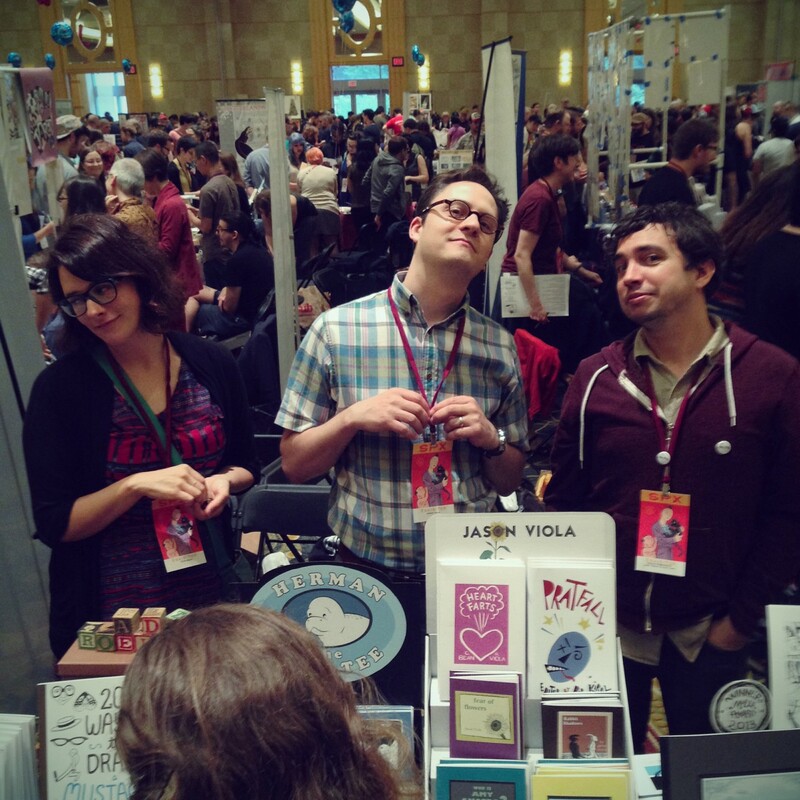 SPX has a lot of priorities that supersede uniting me with my comics family, and it may be that those (raising funds, creating a strong and diverse festival floor, encouraging new talent) were well served by the new non-curation-curation + lottery model. Perhaps because of the intermediate amount of time we’ve been at this, my own friends circle was decimated in Black Death-like proportion. But again, maybe that’s okay. Although my personal belief that one omission was particularly egregious gained popular confirmation when the Best Anthology Ignatz was awarded to QU33R. The book was edited by Rob Kirby, a great cartoonist, a brilliant comics critic, a perennial anthology editor, a stellar gent, and a pillar of both alt comics generally and queer comics in particular, who was not invited and unable to find space at the show. He wasn’t present for a moment none of us would want to miss. I am biased, I readily admit, because I adore Rob, but to me, his absence was a freaking travesty. But then, for him to be there, someone else would have to go. And I wouldn’t want to be the person to make those decisions. I get the impression the SPX organizers don’t love being those people, either. 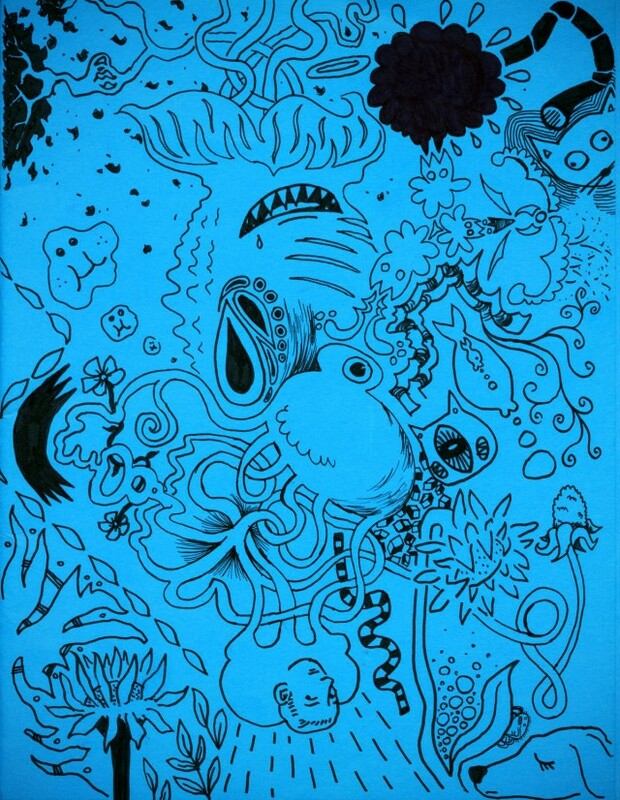 Sunday doodle by Neil, Cara, Jason, Kenan, and Marnie Galloway. Jason: Yeah, I appreciate Neil for inviting us to scrunch into his space. What will happen next year? Because we weren’t legacy exhibitors in 2014, I don’t think we did anything to become legacy in 2015. Will this be our fate? Will we forever be dependent on Neil’s generosity? Will we become staples of the endcap across Topatoco? What happens if Neil can’t make it one year and loses his legacy spot? Are we kaput? Perhaps Kenan will be forced into the role of Published Author, where he will earn a seat at their table. And perhaps I will become an attendee and see everything I’ve always wanted to see. Instead of selling comics inside, perhaps Neil will be in the parking lot, fighting people for money. And everyone will be talking afterwards about how incredible Cara’s panel was. All weekend long I was drunk and exhausted. I talked to a ton of people and stayed up way too late. This means SPX is far better than the days when it forced me to retreat directly from the crowded chocolate fountain to the sanctuary of my quiet hotel room. This year, I give myself an Ignatz Award for Sustained Socialization. I would like to thank Xanax in 2010, Raina in 2011, and therapy in 2012. I wouldn’t be talking to strangers at 1am if it weren’t for them – thank you, thank you. I agree with Kevin. We have so many liked-minded folks to interact with and there is only so much time. We are forced to pick a social path and see what comes of it. Cara is creepy; Kenan is twelve. I felt fortunate to have had some real heartfelt conversations and deep belly laughs in the evenings with new and old friends. 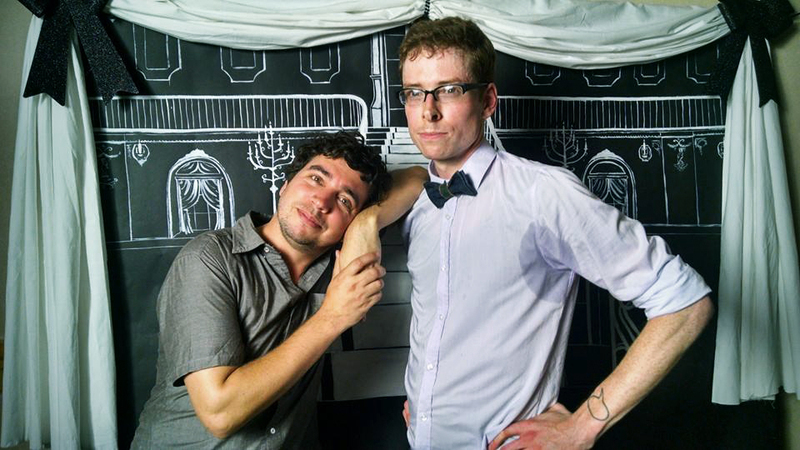 SPX 2014 provided us with Simon Hanselmann’s marriage to comics and held a post-Ignantz Prom featuring DJ Tony Breed. You would have had to try really not to have fun. Ann: Damn, I miss that chocolate fountain. And all of you, of course. 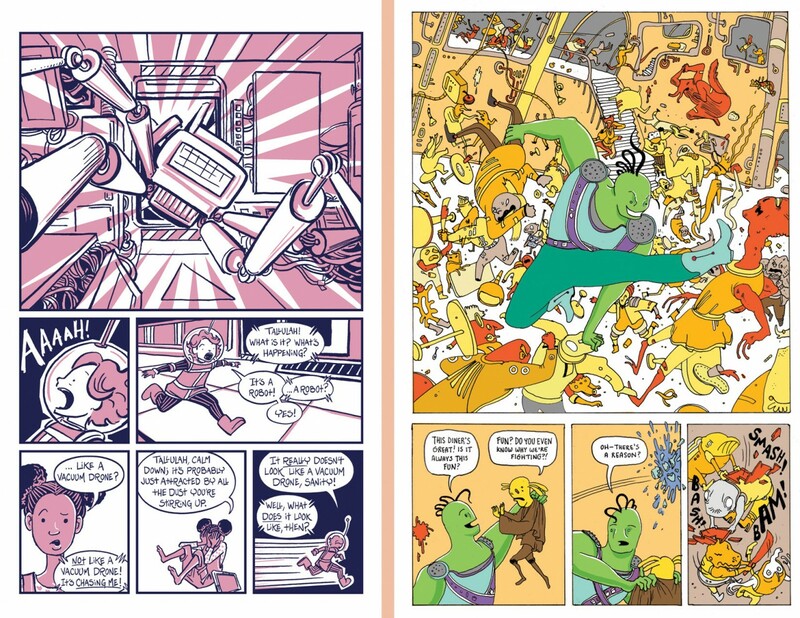 These comics, crafted by different artists (Molly Brooks and Andrea Tsurumi, respectively) and bound together as one another’s flipsides, present two variations on a very specific theme: adolescent female best friends who are also detectives and are furthermore in space. What’s remarkable is how little that description turns out to tell you about either story; though both comedic and seemingly oriented toward young readers, the comics diverge greatly in style, palette, setting, and the characters they introduce. What they share is witty storytelling with a lot of heart and some well-executed surprises. (Also, both artists can draw circles around most of the rest of us.) And both left me feeling less-than-patient for future installments. Some years ago, when his influential (to me, especially) anthology series Papercutter was still in print, I asked Greg Means how he got such consistently good work out of people (I don’t think I’ll be blowing anyone’s mind to suggest that anthologies of previously unpublished work don’t always fulfill the promise of their contributors lists). I think the question’s implied flattery made him uncomfortable and I never really got an answer, and so I don’t know how it came to pass that everyone brought their A-game to this year’s Runner Runner. But they did. 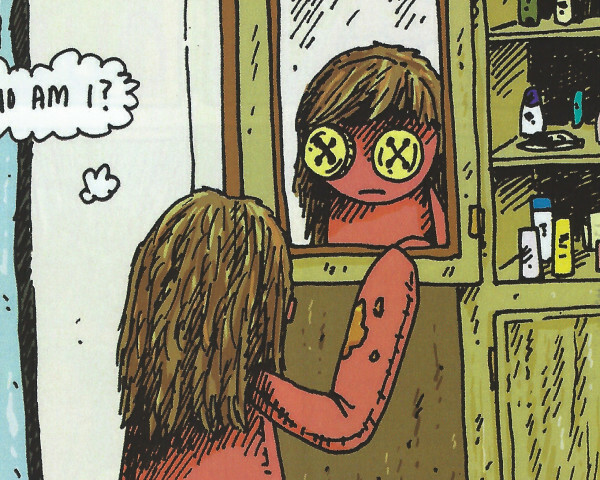 When I first discovered the minicomics shelves at Jim Hanley’s (before Desert Island or Bergen Street or even Rocketship, when JHU was pretty much the only place in New York that carried self-published comics), Papercutter was a quarterly revelation. In its pages I discovered Aaron Renier and Lilli Carre and Sarah Oleksyk, and fell hopelessly in love with alternative comics. 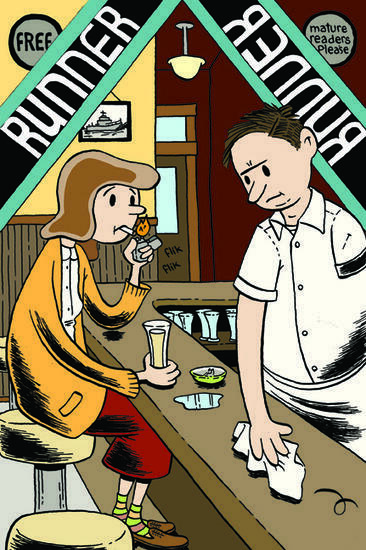 And I like imagining someone new to our corner of the comics world picking up Runner Runner on Free Comic Book Day, and seeing in one small, well-produced zine what we love about Megan Kelso and Minty Lewis and Sams Alden and Sharpe. This is the book to hand to someone who loves you but doesn’t understand why you aren’t spending your time more profitably; just say here, take a look at this, this is what I do. Laura Terry is a humblingly talented cartoonist who seems to fly under a lot of people’s radars, which I suspect is due to her versatility. She creates comics in a range of genres for different audiences in a variety of styles and formats, which makes her work difficult to describe, and, I presume, difficult to market. And yet I always know when I’m looking at one of her comics by the way her characters move; they jump and dive and dance and tumble and toss their weight around in a way that requires very little imagination on the part of the reader. Of course, yes, we are looking at still drawings, and yet we can see them go. The first issue of this youthful adventure makes extensive use of that kineticism, pitting its boy hero against wild beasts and rushing rivers while introducing a cast of plucky animal companions and a diabolical plot. But for me, the most affecting movement happens in its palette, where warm and cool colors swirl to suggest a kind of perpetual dawn, a liminal world of possibilities where undreamed adventures are always beginning. And Terry’s an artist who can deliver on such a promise. 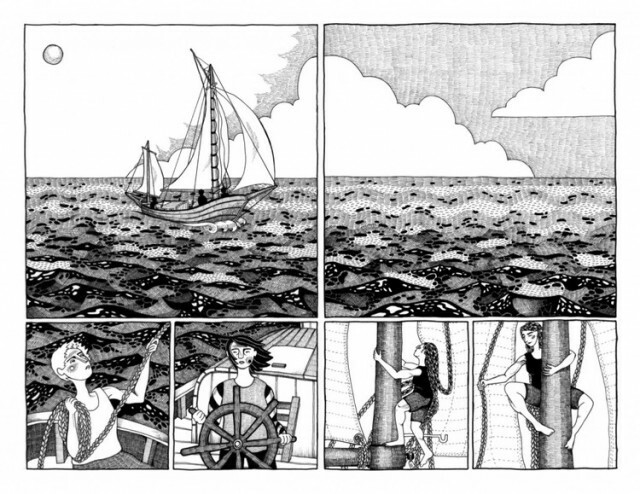 Though ostensibly a silent comic, Marnie Galloway’s nautical tale of cosmology and cooperation is a kind of visual symphony, arranging its icons into phrases and braiding its phrases into motifs, which are then repeated in shifting contexts to build meaning and resonance. In the second of three promised volumes, we see these already clever melodies performed with new confidence; the shapes are bolder and more expressive, the textures more intricate and nuanced, and this authorial precision is echoed by her characters’ own meticulous planning and building. Just what we’re watching them all assemble (or re-assemble, I’d wager) remains a mystery. A lost melody, perhaps, or a lost mythology, or a lost world. We’ve already seen strains of all three woven together, in service, we presume, of the coming crescendo. Still Kenan: This year presented a particular obstacle we haven’t faced in the past. If you find yourself walking to or from the Silver Diner near sunset, you’ll pass an intersection over which literally thousands of birds are congregating on the telephone wires. It is a genuine marvel to behold, until you realize you have to pass under them to get where you’re going. The good news is the sentry fire washes out of denim pretty easily. 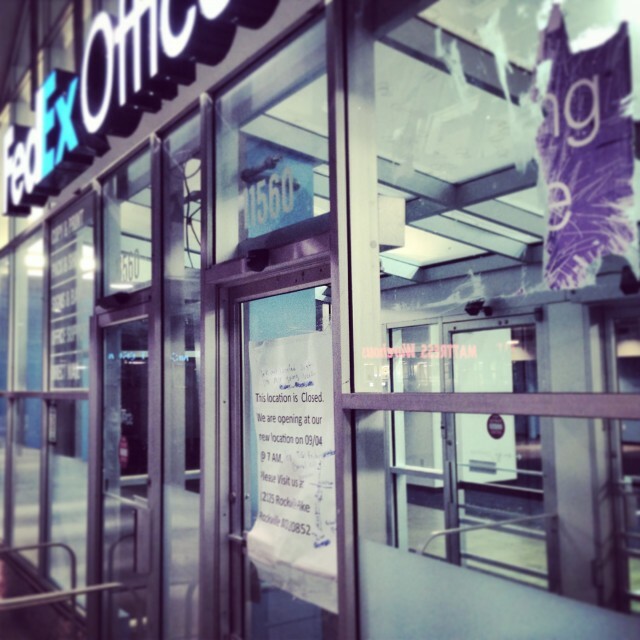 Also: there’s no more Kinkos in the Kinkos. Rumors suggest it moved to make way for the expansion of that nightmarish dystopian Playmobile city where the Whole Foods is? Whatever the reason, it made our annual panicked last-minute print run a little more panicky than usual. R. Sikoryak & Kriota Willberg tear up the dance floor. 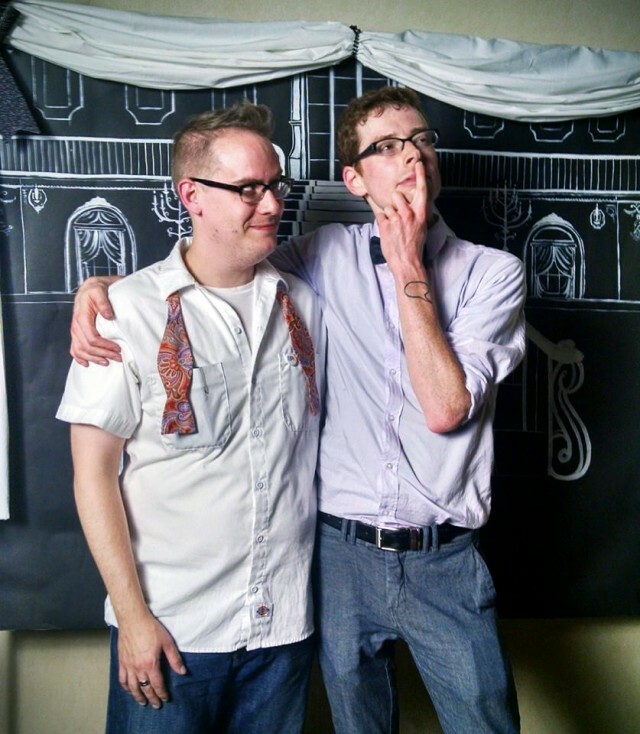 And of course: prom. When I entered the room, I confess, I did not particularly feel like dancing. 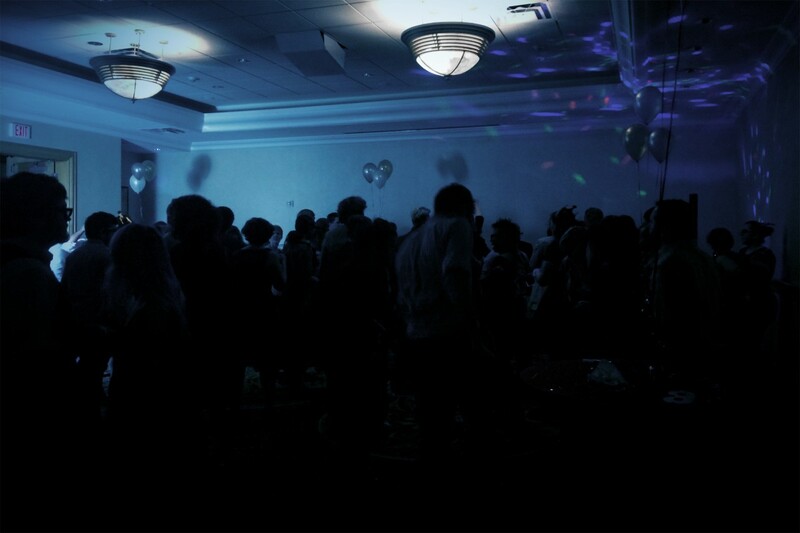 Despite this reticence, and the carpeted dance floor, and the speakers that were in no way up to the task before them, we stayed to close the place. It is a small but heartfelt testament to DJs Tony Breed and Shannon Stewart’s musical curation, and also the enthusiasm and sweet sweet moves of my fellow cartoonists (particularly R. Sikoryak and Kriota Willberg (pictured), SPromX MVPs, holy crap). So many of our friendships are so remote, conducted across state lines in bits and bytes and tweets and tumbls, and yet intimate because of the work and words we share. It was a strange treat, then, to spend time throwing my actual physical body about among people I know so well but actually interact with very little. And I mean, damn, y’all, we looked good out there on the floor. 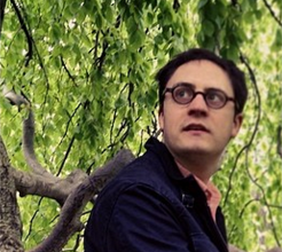 Cartoonist, web designer, founding editor of Festival Season. 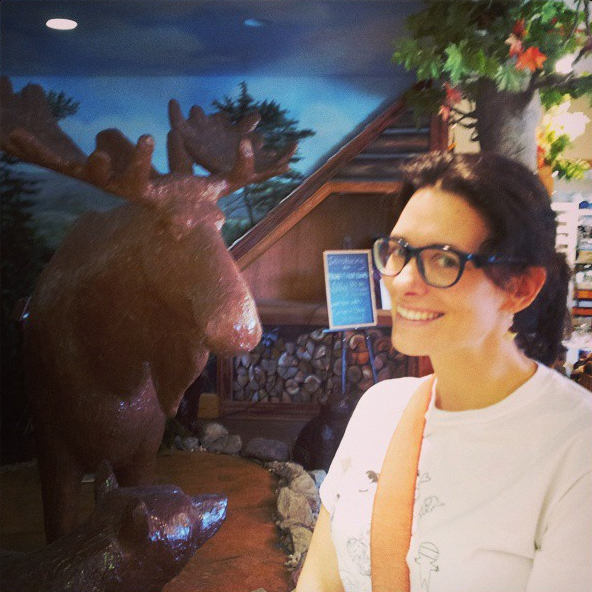 Cara Bean is taking a sabbatical from being a high school art teacher to pursue comics at the Sequential Artists Workshop in Gainesville, Florida. 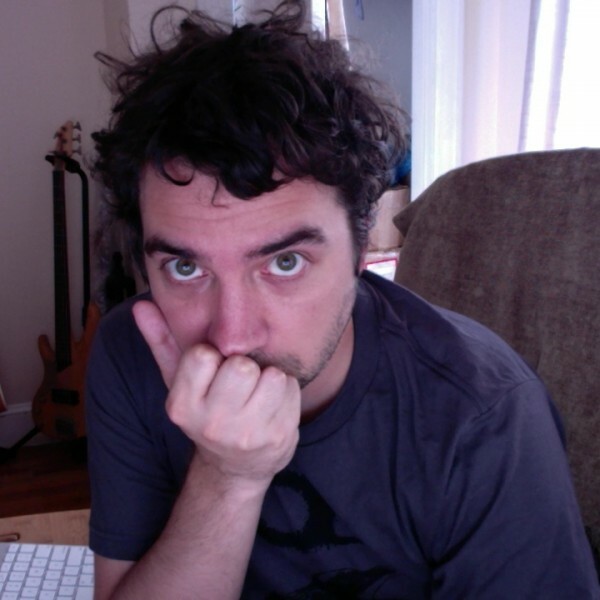 Jason Viola is a cartoonist who lives near Boston. 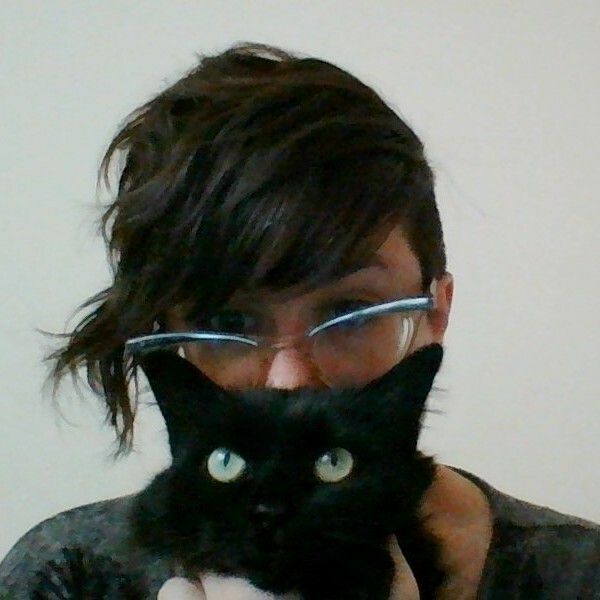 Ann lives in London in a house filled with comics and cats. An artist/educator introduces her students to meditation practice and the concept of "flow." A punk aesthetic finds a stately home at Providence's new Rhode Island Independent Publishing Expo. 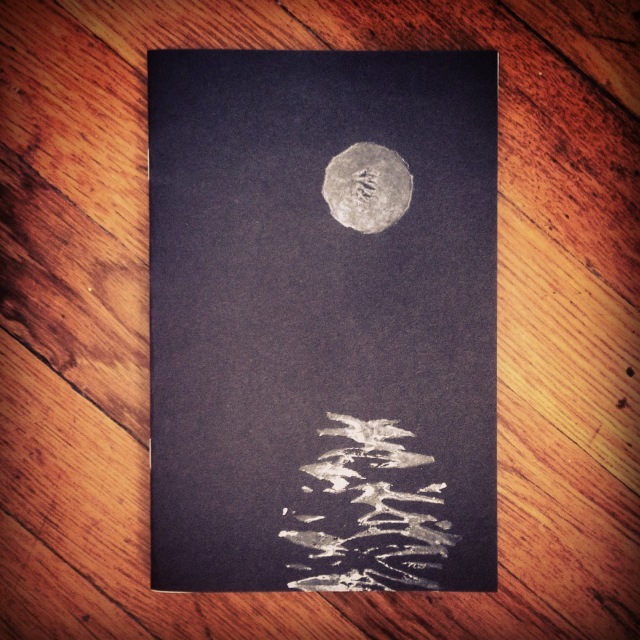 Further reading: Andrea Tsurumi, Cara Bean, Greg Means, Jason Viola, Jeff Zwirek, Kenan Rubenstein, Kevin Czapiewski, Marnie Galloway, Molly Brooks, Neil Brideau, Sam Sharpe, Tony Breed. Falling for Beginners, available now! Kenan's new mini contains two short black and white comics and features a cover hand-stamped with an actual potato. Limited run of 100 copies. Available now.